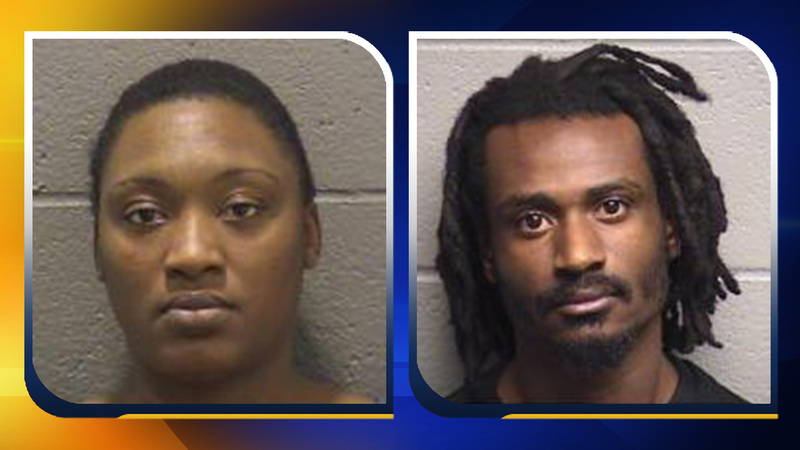 DURHAM (WTVD) -- Durham police have arrested two people in connection with an armed robbery that occurred Sunday night, while a third suspect remains on the loose. Officers arrested Durham residents Joyce Beavers, 35, and Kevin Powell, 26, charging them with robbery with a dangerous weapon and conspiracy to commit robbery with a dangerous weapon. Around 9 p.m., officers were called to the Triangle D Food Mart in the 400 block of Trinity Avenue. Reports show two men armed with guns, wearing black bandanas over their faces robbed the business. Officers said one suspect fired a shot into the floor of the store during the robbery but no one was injured. The suspects fled in a gray car with New York tags. The car was later spotted in the parking lot of Hardee's at 3912 North Duke St. The front passenger jumped out of the car but the other occupants remained inside, officers said. Police are still searching for that suspect, adding that the car was reported stolen on November 18. Beavers was also charged with possession of a stolen motor vehicle. Powell was also charged with failure to appear in court on an earlier charge of hit-and-run. Beavers was placed in Durham County Jail under a $300,000 bond and Powell was booked under a $284,000 bond.